1. What's the story behind this photo and the desert where it was taken? This desert is quiet and hot, extremely hot in the summer. Since there are so few people, and little vegetation, it’s a good place to sweat out the noise of the city and concentrate. Vast spaces extend in every direction and peaceful solitude guided this artist into a creative trance. I was overtaken by my own inspiration into a self-confident process. Here, no one is watching, approving or disapproving. Nature is your only mute companion. However, I did take care to watch out for and avoid rattlesnakes. This flat, salty landscape is along the Sea of Cortez in Northern Mexico. While roaming in my car I accidentally discovered it. It was an unplanned surprise that became a working retreat for a few hours. Nature and I bonded in a romance. I consider desert a modernist, introspective environment. It’s so simple; an incredibly flat plane with the bare minimum of natural decoration. Back home in the city, reviewing the results of this shoot and another in a favorite café, my emotions settled on nostalgia. 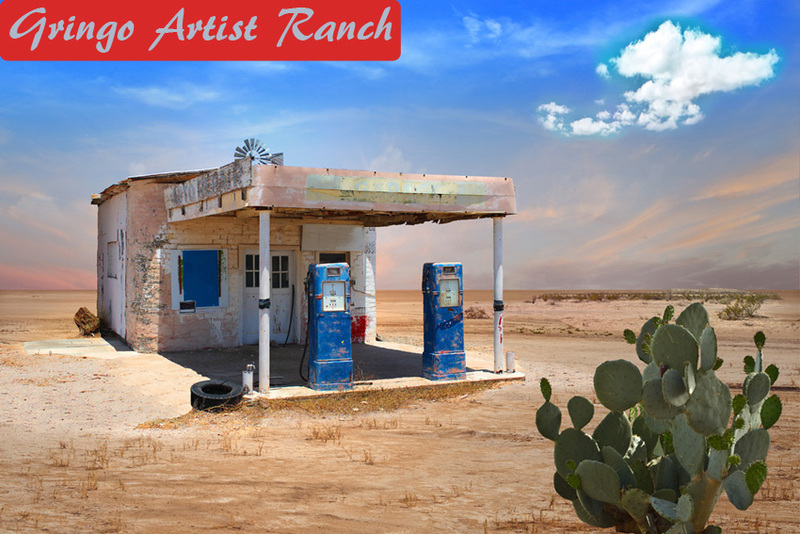 I decided to add to the foreground an antique, weathered gas pump from the other adventure in a different part of the Sonora Desert, in Arizona. On that adventure I was driving up a rural dirt road far beyond the last suburb of Phoenix and suddenly saw an old abandoned gas station. Apparently, that forgotten road had once been the main one between two destinations. 2. What tips would you give to other photographers who want to photograph in the desert? These tips can be anything you can think of, like how to find cool, out-of-the-way places or what to pack in your bag. What do you wish someone had told you before you started traveling to and photographing the desert? Photography in the desert might be the easiest place for landscape photography. There are so many possibilities and so few people to interfere in your project. Basic practices apply, shoot away from sun, unless you’re going for a sunburst effect. Colors are juicier in the afternoon. I’ve found the best way to get emotional content I hope for in an image is to art direct it, that is, combine elements in the studio. Nature doesn’t always arrange the scene with objects in the best place relative to each other. An artist can do that. Find a background you like and simplify it in the studio if it needs it, the same goes for the foreground. Simple shape concepts have impact. As for equipment, the less the better for me, so I can focus on what inspires me. Accept your limits, financially and emotionally, and get started. There will always be a place for you if you can do that. The sooner you do, the closer you’ll be to finding and revealing the message inside you. And it will evolve.